In the New: New Thing #96: I AM a Weiner! Every day for a year, starting on my 29th birthday, I did one thing I'd never done before. Now, whenever the fancy strikes, for the rest of my life, I will be doing New Things, Things I'm Bad At, and Things That Seem Ridiculous. New Thing #96: I AM a Weiner! Me, with guest host Tim Vincent of Access Hollywood trying unsuccessfully to charm my pants off. 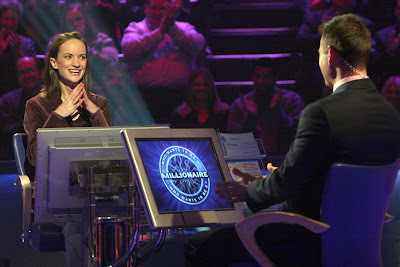 Today I watched the conclusion of my stint on 'Who Wants to be a Millionaire,' then randomly drew a coworker's name and favorite charity out of a hat and will be donating 1% of my winnings to the Brooklyn Animal Foster Network. The show doesn't air on the West Coast until 7 pm, and I don't want to spoil it for my friends and family there, so I'll post the outcome later. My 365 project: The beginning!